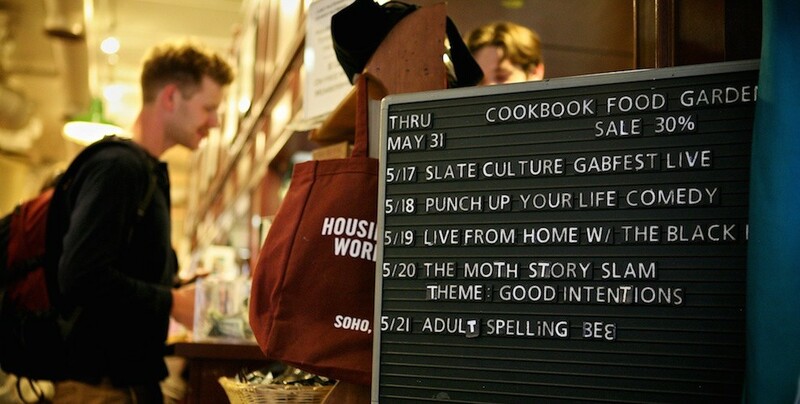 Feb. 6, 2015, 11:11 a.m.
With 6 million downloads a month and a growing set of live events, Slate is showing one potential path for publishers in the post-Serial world: using conversation to build connection. By Simon Owens @simonowens Feb. 6, 2015, 11:11 a.m.
As absurd as it may have sounded to non-Serial fans, the Serial Spoiler Special was a huge hit, generating hundreds of thousands of downloads per episode. “A ton of people who were Serial fans started listening to it and so it brought a whole new set of listeners into the Slate podcasting orbit, which was terrific,” said Julia Turner, Slate’s editor-in-chief. That orbit of which she speaks has grown substantially in recent years. According to Bowers, Slate’s 14 or so podcast shows get about 6 million downloads a month, and its audience has tripled in just the last year. Sure, part of that’s due to Serial’s success bringing millions of new listeners to the podcasting medium. But Slate made a very early bet, long before the mainstream adoption of podcasting was a forgone conclusion, by investing heavily in the audio format, positioning itself to ride the wave as millions of new consumers purchased smartphones and eventually realized that they could download audio files for on-demand listening. 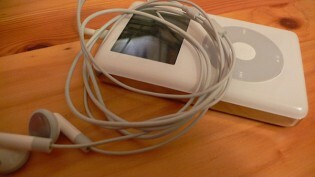 It made that bet while many of its news media competitors shifted much of their focus to online video. Tempted by the high CPM rates on preroll ads, several print media stalwarts have invested significantly in beefing up their video staffs. In 2013, both Meredith and Scripps launched several original web series, and that same year The New York Times hired Rebecca Howard, a former vice president at 20th Century Fox, to head up and expand its video department. But perhaps no company has staked more on video than BuzzFeed, which just accepted $50 million in VC investment, largely to expand its BuzzFeed Motion Pictures division, which racked up a stunning 4.5 billion views in 2014. While Slate certainly hasn’t ignored video (it produces some of its own original programming and regularly aggregates viral videos from around the web), its podcast offerings are much more substantial, having developed fervent, almost fanatical followings from listeners, many of whom are willing to line up around the block just to attend a live recording. So why did Slate see so much success while other news outlets, like The New York Times and Boston Globe, scaled back their audio offerings in favor of video? This put Bowers in the perfect position to usher Slate into podcasting. He began experimenting with the platform by just simply reading out Slate articles so readers could listen to them on-the-go. Even with this rudimentary offering the publication was able to amass about 10,000 regular listeners. He also hosted a weekly discussion with John Dickerson, Slate’s political correspondent. But Bowers’s real insight came while listening in on weekly editorial meetings. “John and his colleagues in Washington had hilarious conversations that sounded like how I was used to hearing reporters talk at the bar or after they appeared on the Sunday talk shows,” he said. “And I thought, ‘If I just put microphones in the conference room, this would be really entertaining. People would hear the honest conversation that reporters have. '” That insight eventually became the Political Gabfest, an hour-long show — hosted by Dickerson, former editor David Plotz, and Emily Bazelon — that’s among Slate’s most popular podcasts. Because Slate doesn’t have to deal with the constraints of traditional radio broadcasting, it’s been able to experiment with the form over the past decade. In addition to its regular shows, it also tried unofficial audio tours of popular tourist attractions; one was recorded by an art critic in the Met. “I was listening to it the other day because I’m here in New York,” said Bowers. “And it still makes me crack up, like when he starts talking about how worthless a particular Picasso is. We got emails from people saying they were standing at the museum cracking up and the guards were looking at them like they’re crazy.” Slate even experimented with a one-to-one connection between hosts and fans; with the success of the live shows, it started selling tickets to private cocktail meetings with the hosts that take place prior to the recordings. They now sell out within minutes. One of its most recent show launches is Slate’s most ambitious yet. A year ago, Mike Pesca, a longtime NPR correspondent who once reported for Day to Day, announced he was leaving public radio to start a daily Slate podcast called The Gist. “As soon as I met him I had the same conclusion that many in public radio had, which is that this guy was a unique talent behind the microphone and should have his own show,” said Bowers. “And for some reason, NPR didn’t give him a show.” The Gist is a sort of daily news magazine, one on which Pesca displays a unique talent for language play while pouring over current events. Aided in part by an excerpt on This American Life, The Gist has quickly become Slate’s most popular podcast. Any consistent listener of podcasts has likely noticed that most podcast sponsors are direct-response advertisers — it’s easy to track the ROI of their sponsorships because listeners are encouraged to plug in a special promo code to receive discounts. The challenge Slate has now is to lure brand advertisers — the kind trying to raise brand awareness rather than direct sales. According to Bowers, Slate is in a unique position to attract these companies because, unlike other podcast networks, Slate’s is affiliated with an established media entity. “Because we’re connected to a larger website, for many years we have had advertisers who were on the Slate site and on the podcasts.” For instance, Acura sponsored a recent live tour of Gabfest, in some cases offering test drives to audience members. Another podcast hosted by Plotz was sponsored by Delta. In a world where advertisers are less interested in pageviews and more focused on audience loyalty, it’s hard to imagine a more loyal audience than that. This story originally appeared on SimonOwens.net. 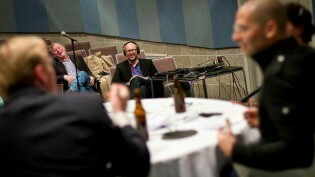 Photo of a live Culture Gabfest event by Steve McFarland used under a Creative Commons license. POSTED Feb. 6, 2015, 11:11 a.m.
Owens, Simon. "Slate’s podcast audience has tripled in a year, and its bet on audio over video continues to pay off." Nieman Journalism Lab. Nieman Foundation for Journalism at Harvard, 6 Feb. 2015. Web. 20 Apr. 2019. Owens, Simon. "Slate’s podcast audience has tripled in a year, and its bet on audio over video continues to pay off." Nieman Journalism Lab. Last modified February 6, 2015. Accessed April 20, 2019. https://www.niemanlab.org/2015/02/slates-podcast-audience-has-tripled-in-a-year-and-its-bet-on-audio-over-video-continues-to-pay-off/.